This article Do synthetic food colors cause hyperactivity? Critics blame the additives for triggering behavioral problems in youngsters was on the front page of the Chicago Tribune on Sunday. I’m happy to see that more people are paying attention to food issues and I’m hopeful that this type of concern is going mainstream. Last year, I learned about food dyes. Just like a lot of things related to food, I never paid that much attention before this project. Sure, food dyes weren’t good, but once in a while? Okay, fine. Just once in a while, right? The school foods I ate that contained food dyes were some of the fruit “icees” (Red #40, Blue #1), the special occasion cookies (I’m guessing Red #40 and there was a green cookie once too…? ), and some of the salad dressings (Yellow #5 & #6). I know that only because those foods either were obviously colored synthetically or the ingredients were listed. I don’t have access to the nutritional information for the foods I ate in 2010 for lunch, so I can’t be sure they weren’t snuck into other things I ate. Earlier this year, a guest blogger shared her experience as a person who is allergic to Yellow #5. I don’t know how she narrowed it down to that, but I have to wonder how many kids go along undiagnosed with allergies and sensitivities, year after year. These dyes have been banned in Europe. Here’s the kicker: US companies with branches in Europe don’t use synthetic food dyes in the products they sell to Europeans. Those same products they sell here? They have the dyes in them. For example, check out this comparison shot of US and UK Nutri-grain bars. I sound like a little old lady school teacher when I say this, but for shame! Previous PostBook Club News!Next PostYou’ve got mail! I don't understand why we can't just get rid of dyes. Ugh! It's in everything! Even white frosting has red #40! We just made a New Years resolution to start eating only all natural or organic food. I really don't care what color my food is and I'm sure adding dyes to it don't make it taste any better! It's amazing how many artificial chemicals are in our food. Yuck! This INFURIATES me. Because I know that the dyes do not help the product taste better. I understand the concept, if a food is brighter then it looks fresher and your brain is more likely to send out the "eat that" signal. But still…doesn't that just mean that companies are manipulating us with marketing? I don't like being manipulated. And I hear you about the soap. Soaps and lotions are my new big things. I am Sooooooo frustrated that most of them aren't real. Most of them have weird synthetic shampoo-ey frangrances, and most of them have dyes. So unnecessary. I recommend a basic castile soap. There is nothnig in there except soaponified oils. I am using that exclusively on my hair and body and on my kids. and all of our skin is healthier so far this winter. There was a boy in my son's playgroup that was allergic to Red #40, it was so difficult since we did lots of table activities and he couldn't use the finger paints, play with play dough, or use the lotion during the massages after the yoga part. He was recently diagnosed and his Mom couldn't believe or understand why it was on so much stuff, especially in his favorite foods! Artificial dyes need to be banned, if not by the FDA take note,consumers are tired of being poisoned by artificial ingredients. More customers need to speak up and voice their opinions. Well this is depressing! As I read your post I checked out the foods I have at my desk and only found dyes in my vitamins (yellow 5, 6 and blue 2). They're vitamins, I don't think the color matters. I know we have a lot of bleached cotton products because people think that snow white is cleaner/better than a natural brown and so bleach gets into our bodies and environment. One shocker to me was after we got a juicer. My husband and I were shocked to find out that tomato juice is really pink (even when you use dark red ripe tomatoes). So what are they putting in all of those drinks?! yuck. The food companies think we consumers have expectations of what food should look like. I, personally, don't need raspberry to be electric blue. I prefer to cook most of the time, this is just another reason to keep doing it! Questions like the one posed in that article drive me crazy. Yes, food dyes cause hyperactivity. And they're connected to all sorts of other problems, too. It's not even a question anymore. Europe has responded to consumer pressure and common sense on this (though it hasn't outright banned all dyes). It's way past time for the U.S. to do the same. for shame is right!! I get soooo frustrated with the capitalistic way. Regarding UK vs US having dyes in manufactured foods: we are the consumers. Obvious to me is that UK consumers expect few dyes and US consumers expect more colorful food. If we don't want food dyes in our foods and stop buying those foods, manufacturers will stop using food dyes in US foods. They only make what we want to buy – duh. We got them to stop putting HFCS in everything, we can stop this too. My family lives in Hong Kong and it's amazing to see the differences in their food products and the ones I get in New York/New Jersey. I hope we can get people to stop using artificial dyes! Your mention of papaya reminds me of my first encounter with my favourite treat, dried papaya, in an US grocery store. I got suspicious, when the naturally vibrant colours seemed a little too "vibrant". The thing had the gall to have an ingredients list in stead of one ingredient (say it with me, "papaya! "), and contained sugar and artificial dyes, all on my little family's (starting March, if all goes well, we're a husband-wife-cat team!) list of things we consciously avoid, due to both weight loss goals, as well as my behavioural issues, that go hand-in-hand with my Asperger's/high functioning autism, and related social issues, which get aggravated by what used to be seemingly random violent mood swings and even bursts of (verbal and emotional) aggression, plus increasingly severe migraines. I've been to the emergency room with stroke-like symptoms, all because of what they thought were hormones. All my mood swings, anxiety, depression and migraines went away when I quit contraceptive pills and artificial dyes, sweeteners and a majority of the sugar in my diet. It took almost 18 months for my body to flush out the (pardon the expression) crap out of my system and me to fully recover, but I've been a picky eater since then, even before I realised dyes are a partial cause. Hailing from Europe, where labelling and a movement for more organic or natural produce and processed foods are a little further along the way than in the US, I'm naturally suspicious to the lesser, or less standardised labelling of food in the US, and have for example noticed that Pringles brand chips are dyed with turmeric and beet extract (!) when I read the ingredient list in Finland, while in the US, there are artificial dyes and "aromas", which means more synthetic chemicals. Mountain Dew in the US is caffeinated, elsewhere, they're not legally allowed to add caffeine, so guess my shock, after I had one, and didn't sleep for two days, got a migraine that required me to take two doses of my emergency migraine medication in the two days that passed (and no, those are not oral meds)… and I realised the cause only when my fiancé pointed out that there is caffeine in that stuff. It's literally minefield to walk through the grocery isles at the local markets in America, when you're from a place that is much further ahead. And in the EU, GMO products have to be labelled as such, so we can avoid them if we choose to. It's like rBST in milk. People stopped buying that kind of milk at walmart, so walmart quit selling it. Your wallets protest better than anything. Squawk away–it helps to make more people realize what's bad for them–but while you squawk, encourage your fellow outraged citizens to boycott. 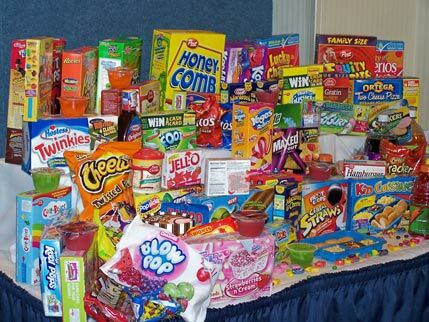 If tons of people stop buying food laced with dyes and HFCS, the manufacturers will lose money. In order to become competitive again, they'll follow the trend and stop adding that crap to their products. Yes, you might have to read labels or make more things from scratch (cooking for our families?! heaven help us! anything but that! ), but when you stop and think about how much of a no-brainer-protest it really is to just STOP BUYING what you don't want to eat, it seems like the easiest thing in the world. My son has to be dye free for medical and health reasons and YES it just chaps my hide (that's Texas talk). On the other hand, I have learned that homemade buttercream is easy and tastes way better. But it is ridiculous the amount of things we can't buy, and it's not just candy and junk food. my kids have been on the feingold diet for a few years now which eliminates the dyes. I have seen a huge behaviour improvement. You'd be surprised to know that since your skin is your biggest organ absorption of colours from shampoos/soaps etc happens at a very fast rate and is not good for you at all. "Food marketers have done lots of research and discovered that the American consumer likes foods that are red, yellow and crunchy." That always stuck with me so I thought I'd share . . . This is a subject near and dear to me… last summer we tried elminating food dye from my six year old's diet, and are amazed at the difference in him now. It can feel so horrible to not allow him to have what others are eating. It comes up all the time. I keep a freezer stash of safe cupcakes I've made, so that I can pull one out and defrost it for parties and things at school. I gave up trying to find a wedding cake he can have. Even the white frosting has blue dye. I promised him he will have his own special mini-cake made by me for that day. I am determined that the rest of the food we get will be safe for him to eat. And then, when he came home, the vomiting began. I thought he had food poisoning, he was THAT ill. I have never seen a young child that ill. Turns out, he is sensitive to red food dye. Fortunately I never bought anything that had a lot of food dye, but he avoids anything that has a lot of dye in it. All our goodies are home made, we don't eat processed/junk/fast food, and it's a good thing-he's also sensitive to corn, soy, MSG, and lactose intolerant. Great post, as always. It's so scary and annoying b/c it seems every day, there are more things I don't know or recognize (or pronounce) and the options for things without harmful dyes and unknown particles become fewer and fewer. Thanks for raising the alarm. I hate that the US has to prove things hurt huge numbers of people before they will protect the public. Food dyes are NOT NECESSARY, if they are harming people (even if its only a small amount of people) then pull them! I guarantee food dyes affect more people than their "studies" show, most people don't realize it though, because unless you do a full elimination diet, you might not notice the differences. I wish the FDA would make products have warning labels for GMOs, artificial food dyes, and other chemical ingredients. The EU labels prove that when consumers know about the differences, they will choose healthier. The US companies just lobby the FDA so consumers will never even know about it. I can say emphatically YES synthetic food dyes cause hyperactivity and emotional issues in some kids (probably most). When my son, who is super sensitive to everything, gets food coloring we know we're in for a long day. It makes him wild (putting it mildly) he yells just to yell, he gets angry, he cries a lot, and he can't listen. I say "can't" because his eyes get this glazed over look to them and you know he's not hearing a word you're saying. Needless to sat we avoid food dyes as much as possible. Food dyes are definitely bad news. We are a Feingold Diet family too and it has been such a positive change for us. The good news is it seems food companies are starting to listen. I recently read the nutrition information on the wild multi-colored goldfish crackers expecting to see every synthetic color under the moon and was very pleasantly shocked to see a list of natural colorings including things like watermelon juice and annatto. It should also be noted that the FDA will be holding hearings on food dyes in March.